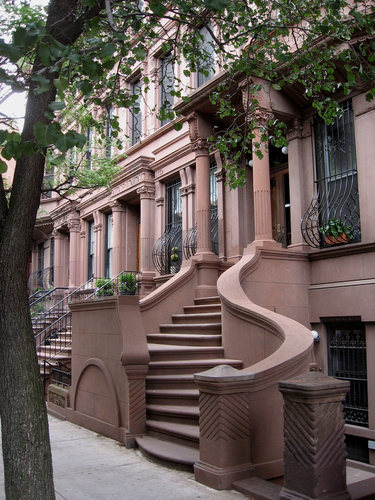 The Mount Morris Park Historic District was first designated by the New York City Landmarks Preservation Commission. Being one of the earliest landmarked districts in the 5 boroughs in Harlem, it covers a 16 block area in Central Harlem. Going north from West 118th to West 124th Streets and West from Fifth Avenue to Adam Clayton Powell, Jr. Boulevard (7th Avenue) Mount Morris Park Historic District showcases a remarkable blend of late 19th and early 20th century residential and church architecture associated with the Gilded Age. The well known “Doctors’ Row” commonly known as West 122nd Street, Mount Morris Park West, and Malcolm X Blvd. all demonstrate the remarkable survival of substantially unaltered 19th-century streetscapes, rare in most areas of Manhattan. Once the walking tour comes to a close you will be treated to a lunch at a local Harlem restaurant. 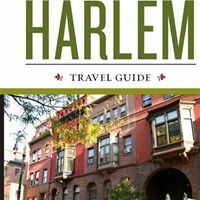 Welcome to Harlem takes pride in showing off our beautiful city and sharing the history of the Mount Morris Park Historic District and all of the beautiful sights along the way! Amor Cubano is the best place for an authentic night of Cuban entertainment and cuisine. Live music and dancing fill the front of the restaurant. In back, where the décor evokes the feeling of a Cuban backyard patio, complete with outdoor furniture and faux-laundry hanging on clotheslines, you can hold quiet conversations while dining on typical Cuban dishes. Locals flock here because the portions can easily serve two people and are superb. Favorites include garlicky lechon asado – roast pork with bitter orange mojo sauce; vaca frita – shredded bits of steak fried with onions and garlic; the hearty garbanzos fritos—chickpeas crisped with smoked ham and bacon; or the more contemporary Cubano frito—Cuba’s take on the hamburger, presented as two sliders made from ground beef, pork, and Spanish sausages. In addition to the food, locals flock here for the music. On weekends, the talented house band, Ray y Su Son Sonete, belts out great son (Afro Cuban music), salsa, and rumba. On Thursdays the restaurant’s signature drink, mojito, in five different flavors, flows all night at the bar for $5. Every Tuesday trovadores (Cuban folksingers) are invited to perform starting at 7:30pm. Sunday brunch provides unlimited sangria in pineapple or red wine versions and bottomless mimosas. Looking for a quick, cheap meal? Head over to Pee Dee Steak House for steaks, barbecued ribs and chicken. Need to shop? You might find what you want at Danny K Fashions. There’s a large selection of brand name sneakers for men, women and children as well as T-shirts and jackets. Transportation: Bus—M101, M102, M103. Subway—6 to 110th St.
Nearly a million people line Adam Clayton Powell Jr. Blvd. to watch dignitaries, celebrities, bands, and marching brigades from twelve states, including at least one band from an historically Black college, make the more than thirty-block trek to promote unity, dignity, and pride. Just about every community of African descent is represented in the parade, including representatives from the West Indian Day Parade, Panamanian American, and Senegalese Federation, just to name a few, along with Harlem-based community organizations. Location: Adam Clayton Powell Blvd. from 111th to 142nd Sts. Casa Frela Gallery is committed to the community of Harlem and the enrichment of cultural life throughout New York City. The gallery creates and produces programs that connect the inhabitants of Harlem with local and international art, music, and culture. Casa Frela also runs programs that trace local culture and history through written research and the oral stories of lifelong residents. Through these activities and programs, the gallery hopes to elevate the cultural standard of living and provide a comfortable, social place to experience art and music. The gallery is also available for event and meeting rental. Need a place to stay? Harlem’s In at Carmen’s Bed & Breakfast a wonderful Victorian row house-style brownstone in the Mount Morris Park area is for you. Continue the local community feel with a stop at Ristorante Settepani. This bakery and light fare menu restaurant has been a neighborhood staple since 2000. An extensive dessert menu, a complete wine list and draft beers round out the menu. Transportation: Bus—M1, M7, M102, M116. Subway—2, 3 to 116th St.
One of the new places on the “Gold Coast”, yes this area of Central Harlem won the 2010 Curbed New York neighbor of the year. 5 & Diamond is one of the many reasons why. They have an outdoor seating area along with a menu of good American fare like mac’n cheese, burgers, steak and fries along with a variety of vegetarian dishes. They have a special happy hour menu, 5@5 that offers wings, sliders and vegetable tempura along with beer, wine and cocktails. Down the block is 67 Orange Street one of the hottest cocktail lounges in the city and Modsquad Cycles, the best place to rent bikes in Harlem for a ride in Central Park. Transportation: Bus—M4, M10. Subway—B, C to 110th St. The 369th Regiment Armory, one of the last armories erected in New York City, combines both medieval motifs common to armory designs and Art Deco influences. The drill shed, which was designed by Tachau & Vought, was built between 1921–24. The massive administration building, which was designed by Van Wart & Wein, was erected between 1930–33. The complex, which was designated a landmark in 1985, is constructed of brick and the administration building embellished with prominent terra-cotta parapets. The Armory is the home of the renowned Harlem Hellfighters, the first African American regiment to fight in World War I, but with the French Army because white American soldiers did not want to fight next to Blacks. Their bravery won them France’s highest honor, the Croix de Guerre with silver star, for the taking of Séchault in Northern France. Upon returning home, the 369th Regiment received a heroes’ parade marching from the Washington Square Park Arch to Harlem, but received no recognition from the U.S. government. The 369th Historical Society was founded in 1960 to organize and showcase the merits of African Americans who served in the U.S. military from World War I to the present through its collection of hundreds of photographs and dozens of artifacts, papers, and other items, including bugles from the 369th Regimental Band led by James Reese Europe, which introduced jazz to Europe, and a copy of the 1920 book From Harlem to the Rhine: The Story of New York’s Colored Volunteers, which gives a chronology of the 369th Infantry. In the 369th Hall of Fame stands a replica of the monument that was dedicated in memory of the 369th Harlem Hellfighters and erected in Séchault, France, in 1997. Across the street from the Armory stands a memorial to the Harlem Hellfighters—a black granite obelisk replica of the one erected in France. Unveiled on September 29, 2006, the 88th anniversary of that battle, the obelisk is 12 feet high and features gilded inscriptions, the 369th’s crest, and its coiled rattlesnake insignia. The Armory also houses the Harlem Tennis Center, where aspiring U.S. Open players hone their skills on professional courts. Walk a few blocks downtown and one block west to 138th and Malcolm x Blvd and visit the Harlem Community Flea Market. This indoor/outdoor year round flea market offers a huge variety of goods. In need of a refreshment?Miss Maudes’ Spoonbread Two is nearby with comfort food served Southern style like candied yams, collard greens and mac and cheese. Transportation: Bus—M1, M7, M102. Subway—3 to 145th St. The most visited urban park in the U.S.
Central Park, both a National Historic Landmark and the first New York City Scenic Landmark, is located between 59th and 110th Streets between Central Park West (Eighth Ave.) and Fifth Avenue, and is 843 acres in size. The northern area of the park is located in both East and Central Harlem. It is among the most famous parks in the world and was the first landscaped public park in the United States. The land for the park was purchased for $5 million in 1856 and consisted of swamps, bluffs, and rocky outcroppings. In 1857, the Central Park Commission held the country’s first landscape design contest and selected the Greensward Plan submitted by Frederick Law Olmsted and Calvert Vaux, considered the founders of the landscape architecture profession in the United States. Entirely man-made, Central Park is one of the urban wonders of the world, a green oasis in the midst of the great concrete high-rise landscape of New York City. The building of the park was one of the nineteenth century’s most massive public projects, with some 200,000 workers used to pull off this great feat. The park first opened for public use in the winter of 1859. 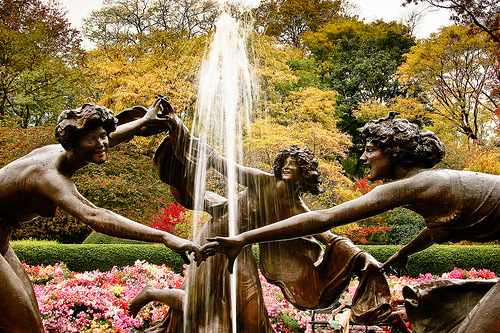 The park contains eighteen different entrances, nearly fifty fountains and monuments, twenty-one playgrounds, fifty-one sculptures, and thirty-six bridges and arches. There are 58 miles of pedestrian paths, 4.5 miles of bridle paths, 6.5 miles of park drives and 7 miles of benches (nearly 9,000 benches in total). Today there are 26,000 trees, including 1,700 American elms. It is visited by over 25 million people each year. Some of the most popular places to visit in the park are the Great Lawn, where the New York Philharmonic and the Metropolitan Opera hold two free concerts in the summer; the Delacorte Theatre, which is home to “Shakespeare in the Park”; Strawberry Fields, which is the garden of peace built in memory of Beatles member John Lennon; Summer-Stage at Rumsey Playfield, where music, spoken word, and dance performances are held during the summer; and Wollman Ice Skating Rink, to name a few. In the portion of the park located in Harlem, you will find the Conservatory Garden, which is the only formal garden in Central Park; the Harlem Meer, an 11-acre lake that makes it the second largest man-made body of water in the park; the Charles A. Dana Discovery Center, which is the park’s only environmental educational center; the Blockhouse, a fort still standing from the War of 1812; Lasker Pool and Rink; and Duke Ellington Circle, featuring the first monument in New York City dedicated to an African American and the first memorial in the United States honoring jazz music giant Duke Ellington. Facilities: Baseball fields, basketball courts, bicycling and greenways, dog runs, fishing, horseback riding trails, ice skating rinks, swimming pool, nature centers, paddle boat, rowboat, and canoe rentals, playgrounds, recreation centers, restaurants, soccer fields, tennis courts, volleyball courts, zoos, and aquariums. There is absolutely no reason to leave the park until you want something to eat and there are two great places nearby – Ottomanelli Bros., for great burgers and steaks and a fabulous pre-fix brunch Saturday and Sunday for just $9.95; and Miss Mamie’s Spoonbread who serves up real soul food, at great prices. Transportation: Bus—M1, M2, M3, M4, M10, M96, M106. Subway—B, C, 2, 3, 6 to 110th St.
Billie’s Black, named after owner Adriane Ferguson’s mother, offers soul food with an elegant and creative twist. Catfish fingers on the appetizer menu, are so good that they are a meal unto themselves. You will also find an array of exotic mixed drinks on the menu, but the regulars swear by the mojitos. There is always something happening at Billie’s, like karaoke every Tuesday (no cover), Funny Friday comedy where seasoned and up-and-coming comics get their jokes on (cover $10 in advance and $15 at the door), live jazz and R&B ($10 cover), and spoken word ($5 cover)—just check the website calendar. Billie’s So Damn Happy Hour features $5 well drinks, beers, and appetizers from 5pm to 9pm. Cedric’s Restaurant just opened up and nothing things but good things are being said at this place. Officially the “New Hot Stop in Harlem”. Or good around the corner and checkoutMoca Restaurant and Lounge holding it down with their live DJ, spoken word and more. Transportation: Bus— M2, M7, M10, M102. Subway—B, C, 2, 3 to 116th St.
It’s like Rive Gauche in the heart of Harlem: Chez Lucienne, Harlem’s first French bistro. This inviting eatery was opened in early 2009. Add to the mix executive chef Thomas Obaton, who cooked with master chef Guy Savoy in Paris, and you have a body of experience and talent that delivers a memorable dining experience. Bistro classics such as Coq au Vin, Steak frites, Boeuf Bourguignon, Mussels with frites and Tuna Tartare are some of the favorite picks on a menu of traditional French dishes, an extensive wine list, exotic cocktails, and scrumptious desserts. The reasonably priced prix-fixe lunch special is one of the best bargains in Harlem. The sixty-seat eatery, with comfortable and inviting décor that includes powder blue banquettes, also offers outdoor dining during late spring, summer, and early fall. The friendly and professional service, authentic French music wafting in the background, and quality food at affordable prices makes this place a winner. Check out their live entertainment on Saturday night when they have a new live band every week playing jazz, R&B, soul and Afro-beats. Because of its popularity, advance reservations are recommended. To make it a complete evening stop by the Maysles Cinema, a new theater dedicated to the exhibition of documentary film and video. The Lenox Lounge is a stop for those after dinner cocktails and some great live jazz entertainment. Transportation: Bus—M2, M7, M60, M100, M101, M102, BX15. Subway—2, 3 to 125th St.
We don’t know what came first, the name Famous Fish Market or—because the fried fish is so doggone good—the reputation. This place does one thing, and does it right …. fried fish, shrimp and chips. The take-out-only basement restaurant is literally a hole in the wall and can easily be missed if it weren’t for the long line, especially for dinner, which snakes down St. Nicholas Avenue. Portions are more than generous and the price is right. Make a stop at the Harlem School of Arts while in the neighborhood. The school is a cultural destination in Harlem presenting dance, music and theatrical productions. Hamilton Grange is a short walk away. It’s the only home owned by Alexander Hamilton and offers tours, re-enactments and live music. Transportation: Bus—M3, BX19. Subway—A, B, C, D to 145th St.